The skills modules of DBT provide a wonderful introduction into the comprehensive world of DBT treatment. Learning and teaching DBT skills in either an individual or group format will equip your clients to build a solid foundation for a meaningful life. This course will provide you with the philosophy and format to teach all four standard DBT modules as well as two extra supplemental modules that can deepen you and your client’s respective skills toolkits. Learn each standard DBT skills module and two supplemental modules. Learn creative and innovative techniques to keep client’s engaged in today’s technology-centered world. Explore the different modes of skills groups to set up the most effective program for your practice. Set up skills group treatment expectations and behavioural contracts. Eboni Webb, Psy.D., HSP is a licensed psychologist and serves as an advisor to the Dialectical Behavior Therapy National Certification and Accreditation Association (DBTNCAA). She has practiced in numerous community settings including clinics that treat underserved communities of color, clients with developmental disabilities, and clients suffering from severe and persistent mental illness. She worked at the largest mental health clinic at the time in the Minneapolis/St. Paul area that specialized in treating clients diagnosed with Borderline Personality Disorder (BPD) with Dialectical Behavior Therapy (DBT). She has practiced DBT in community mental health centers and developed two special DBT-oriented treatment programs for clients with developmental disabilities and borderline-intellectual functioning. 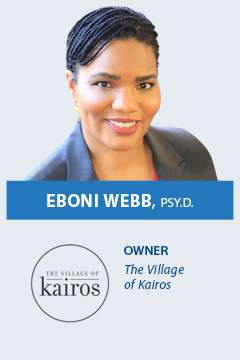 Dr. Webb currently resides in Nashville, TN where she has been serving clients in her private practice, Kairos. She continues to specialize in individual and group DBT as well as cognitive-behavior strategies that address a myriad of clinical issues. She also offers special group therapies for adults and a dual-track of teen skills training that includes their parents. She is currently working to adapt DBT for clients with severe and persistent mental illness (e.g. psychotic-based disorders). Rates: $119.00 plus tax for a room with 2 Queen beds or 1 King bed. Please reference “Jack Hirose & Associates” or booking code “JHA” when making a reservation. * Please check back at a later time as this information will be updated when corporate/group rates are secured.